“Includes wheels for easy portability from room to room. Believe it or not the cheapest model on this list is also the our best overall pick. 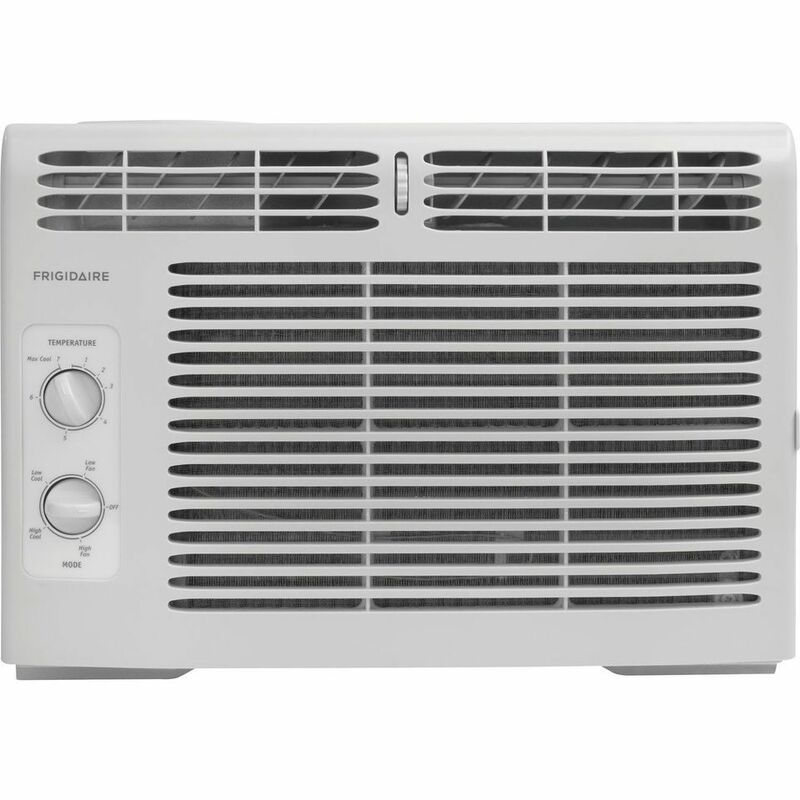 If you have a smaller space to cool and a smaller budget to work with, the Frigidaire FFRA0511R1 is a simple air conditioner for any room up to 150 square feet making it a good pick for home offices or bedrooms. This 5,000 BTU unit gets experts’ top marks for effectiveness and solid marks for noise, but it costs a lot less than most other window units. The FFRA0511R1 doesn’t have a lot of bells and whistles, but many reviewers actually like the simplicity. It has seven temperature settings, two fan settings and two cool settings that can be controlled with dual dials on the unit. There isn’t a remote, timer, or digital thermostat, but reviewers don’t mind, saying it keeps them cool and that’s what matters. They say noise is average for a window air conditioner, but it might not be the best pick for a bedroom for those who don’t want a good amount of white noise. At just 15 by 16 by 12 inches, the white FFRA0511R1 lives up to its billing of “mini,” but users can install side panels to fit windows up to 36 inches wide. It comes with a one-year warranty that extends up to five years for the sealed system. The only drawback is that it isn’t Energy Star-rated. If you’re willing to spend a little bit more on a small-space window air conditioner, the Friedrich Chill CP06G10B is a good pick. This 6,000 BTU air conditioner has more features and can cool off rooms up to 250 square feet. The unit comes with three cooling and fan-only speeds, a 24-hour timer, a remote control, four-way air-flow, and an energy-saving mode. Owners give it good marks for noise, saying it’s quieter than most window air-conditioners and is ideal in a bedroom for light sleepers. The Chill is much larger than the budget Frigidaire FFRA0511R1 at 14 by 18.5 by 21 inches. It is Energy Star-rated for efficiency and has a one-year warranty that extends to five years for the sealed system. Its side panels can extend to fit up to 36-inch windows, and those panels feature “EntryGard” protection that help protect against intruders who may otherwise be able to kick in air-conditioner panels to get into your home. Anyone with a larger living room or loft space that needs to be cooled should check out the LG LW1216ER, a 12,000 BTU air conditioner that can cool larger rooms up to 550 square feet. Reviewers say it keeps them nice and cool without inflating their utility bills and manages to keep noise to a minimum. Experts agree, giving it the highest possible marks for comfort in testing, and very good ones for noise when it’s on a low setting. The LW1216ER has the features most buyers expect in a window air conditioner, including a remote control, an energy-saving mode, a 24-hour timer, four-way air deflection, three cooling speeds and three fan speeds. Reviewers say the unit is easy to use and among the quieter window air conditioners they’ve owned, especially on lower speeds. Many rave about how cold it keeps larger spaces, even when the temperature is sky-high. The white, boxy LW1216ER looks like a typical window air conditioner and measures roughly 24 by 15 by 22 inches. It comes with a limited one-year warranty and weighs a hefty 81 pounds, so consider grabbing a friend for installation. Frigidaire is a giant in the world of window air conditioners, and the Frigidaire FFRE1033Q1 is a good pick for anyone who needs to cool a medium-size room, reviewers say. This 10,000-BTU unit is recommended for rooms up to 450 square feet, and it gets solid marks for effective cooling and ease of use. The FFRE1033Q1 features eight-way air deflection, a temperature-sensing remote control, a low-power energy-saving start, and a programmable 24-hour timer. It also has a clean-air ionizer, a feature sure to please allergy sufferers. While you would expect an AC this powerful to be loud, it gets solid expert marks for noise, particularly on low fan speeds. Owners offer mixed reviews: Some say it’s noisier than they would like, while others aren’t bothered. Like most window air conditioners, the FFRE1033Q1 is white and boxy with expandable side panels that allow it to fit windows up to 36 inches wide. The air conditioner itself is about 21.5 by 19 by 14.5 inches. It comes with a limited one-year warranty that extends to five years for the sealed system. If you’re looking for a window air conditioner that can cool off a smaller space well, the LG LW8015ER is a tried-and-true 8,000-BTU unit that is recommended for rooms up to 340 square feet. Experts even give it top marks for effective cooling and ease of use. The LW8015ER features a thermistor thermostat, four-way air deflection, a remote control, an energy-saving mode, and a timer. It also has a few more thoughtful touches including easy-to-direct fan blades and anti-corrosion coating so the unit won’t break down as fast. Experts say it’s relatively quiet on low and still manageable on high, and most reviewers agree that noise isn’t an issue. They also say installation is a cinch. Like most window air conditioners, the LW8015ER is white and boxy with expandable side panels that allow it to fit windows up to 36 inches wide. The air conditioner itself is about 19.5 by 19.5 by 12.5 inches. It is Energy Star-rated for efficiency and comes with a one-year warranty. Smart air conditioners have been slower to take off than other Wi-Fi-connected home appliances, but owners say the Frigidaire FGRC0844S1 Cool Connect is worth the upgrade. This 8,000 BTU unit is best for medium-size rooms up to 350 square feet. The Energy Star-certified Cool Connect’s biggest draw is its Wi-Fi connectivity, which allows iPhone or Android users to fully schedule and operate the air conditioner from anywhere. Most owners say this feature is simple to set up, and the app is easy to use — it even integrates with Amazon’s Alexa and Google Assistant. If you don’t carry your phone around your home, the Cool Connect also comes with a remote control. There are three fan and cooling speeds, an energy-saving sleep mode, and a built-in ionizer that cleans the air. Noise gets mixed reviews from owners. The Cool Connect is a lot sleeker than a typical window air conditioner, with a clean white front and a sleek mesh grill that design-conscious buyers appreciate. It’s also relatively compact at roughly 18.5 by 16 by 13.5 inches. It has a limited one-year warranty that extends to five years for the sealed system. Portable air conditioners can be a good alternative for anyone who can’t install a window unit, and owners say the Honeywell MN10CESWW is among your best choices. This 10,000 BTU unit is ideal for rooms up to 350 square feet. The Honeywell features an LCD display and digital controls that owners say are easy to use, though a few complain they’re too sensitive. It also has a built-in dehumidifier, a programmable timer, and a remote control. Experts with The Sweethome say it’s the quietest portable air conditioner they tested at low settings, and owners say it’s no noisier than a typical window air conditioner. While you don’t get a color choice with most air conditioners, the Honeywell comes in black; black and silver; and white. It’s about 29 inches high, 18 inches wide and 15 inches deep, and unlike window air conditioners, it demands some floor space. The auto-evaporation system means users don’t have to empty a drip pan, but water may still have to be drained in high-humidity conditions. The unit has a one-year warranty that extends to five years for the sealed system. Want to take a look at some other options? See our guide to the best portable air conditioners. 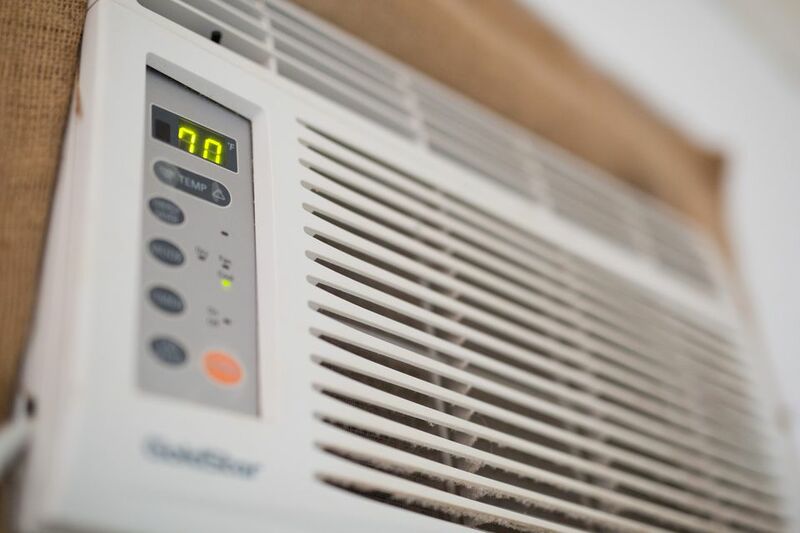 Split system air conditioners are different from standard window units because they have two main parts — a ductless indoor unit and an outdoor unit. This type of air conditioner is typically more expensive than window-mounted units, but the benefit is that you don’t have a cumbersome device in your window all summer. The Mini Split System Air Conditioner & Heat Pump from Pioneer is a highly-rated split system air conditioner with a cooling and heating capacity of 12,000 BTU, meaning it can cool a larger room with ease. It uses a minimal amount of electricity, and both its indoor and outdoor fans are extremely quiet. The indoor section has a sleek modern design, including a dimmable LED display, and it can be mounted on the wall to where needed. The unit comes with a wireless remote control, as well as all the equipment needed to install it, including copper tubing, drain line extension and more. However, reviewers note that installation is pretty complicated, and if you’re not familiar with HVAC processes, you might be better off paying for professional installation. Portable air conditioners are popular among people who can’t install a window unit, and the Costway 10,000 BTU Portable Air Conditioner is a great option for small to medium-sized rooms. The multi-function unit can be used in all areas of the house, and it includes wheels for easy portability from room to room. The Costaway Portable AC has both cooling and dehumidifying settings, and it boasts fan and sleep modes as well. There are two fan speeds that can be controlled via its LED control panel or wireless remote. It can be set anywhere between 62.6 to 86 degrees Fahrenheit, and you can program it to automatically turn on and off according to your schedule. The downside of this portable air conditioner is that it must be vented to a window using the included exhaust tube and window seal plate. This can be a bit unsightly, but reviewers say it is an effective cooling unit nonetheless. Our reviewers spent 45 hours testing one of the most popular air conditioners available. To get truly well-rounded results, we asked them to consider the most important features when using this air conditioner, including its BTU, performance, and various customizable features. We outlined the can’t-miss points here so that you, too, know what to look for when shopping. Type Window units tend to be the most popular because they are affordable and easy to install, though some homes and apartments with unusually shaped windows may not accommodate these models. Portable units are a great alternative and can be moved from room to room. However, the downside to those models is that they require more maintenance and are not as efficient. Built-in or split systems offer a more permanent solution but require professional installation. BTU level Energy Star recommends units around 6,000 BTU for rooms up to 250 square feet; 8,000 BTU units up to 350 square feet; 10,000 BTU units up to 450 square feet; and 12,000 BTU units up to 550 square feet. ﻿Features A programmable timer or a sleep setting is a helpful feature to help curb energy consumption and keep utility bills in check. For those with allergies, an electric ionizer or additional venting options can help with recirculation, keeping the air cleaner. A filter alert is also helpful since it notifies you when it’s time to change the machine’s filter. This air conditioner worked very well in a small space, according to our reviewers. “It makes the room nice and cold on the low setting. Especially in New York City — where small bedrooms are common — it's a great option,” one tester noted. On the flip side, our reviewers wished it came with a longer power cord: “You’ll need an extension cord if your window isn't near an outlet,” one said, “which actually isn't recommended for air conditioners, so it’s not at all ideal.” One tester also observed it was a little noisy when she first used it, but that it quieted down after a few hours.